The DPDK Kernel NIC Interface (KNI) allows userspace applications access to the Linux* control plane. Faster than existing Linux TUN/TAP interfaces (by eliminating system calls and copy_to_user()/copy_from_user() operations. Allows management of DPDK ports using standard Linux net tools such as ethtool, ifconfig and tcpdump. Allows an interface with the kernel network stack. The components of an application using the DPDK Kernel NIC Interface are shown in Fig. 21.1. Creates net devices (via ioctl calls). Maintains a kernel thread context shared by all KNI instances (simulating the RX side of the net driver). 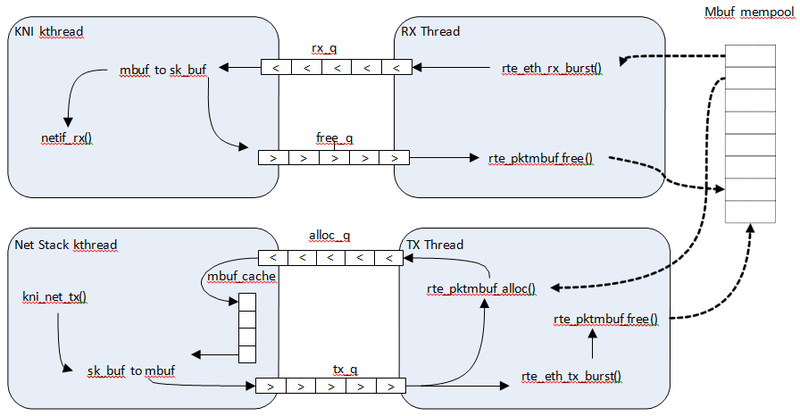 For single kernel thread mode, maintains a kernel thread context shared by all KNI instances (simulating the RX side of the net driver). For multiple kernel thread mode, maintains a kernel thread context for each KNI instance (simulating the RX side of the new driver). 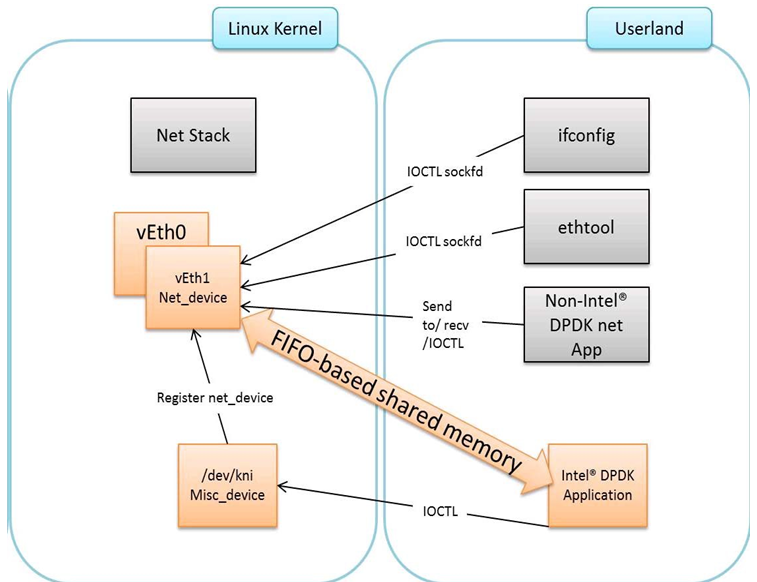 Net functionality provided by implementing several operations such as netdev_ops, header_ops, ethtool_ops that are defined by struct net_device, including support for DPDK mbufs and FIFOs. The interface name is provided from userspace. The MAC address can be the real NIC MAC address or random. Physical addresses of the corresponding memzones for the relevant FIFOs. Mbuf mempool details, both physical and virtual (to calculate the offset for mbuf pointers). Refer to rte_kni_common.h in the DPDK source code for more details. The physical addresses will be re-mapped into the kernel address space and stored in separate KNI contexts. The affinity of kernel RX thread (both single and multi-threaded modes) is controlled by force_bind and core_id config parameters. The KNI interfaces can be deleted by a DPDK application dynamically after being created. Furthermore, all those KNI interfaces not deleted will be deleted on the release operation of the miscellaneous device (when the DPDK application is closed). To minimize the amount of DPDK code running in kernel space, the mbuf mempool is managed in userspace only. The kernel module will be aware of mbufs, but all mbuf allocation and free operations will be handled by the DPDK application only. Fig. 21.2 shows a typical scenario with packets sent in both directions. On the DPDK RX side, the mbuf is allocated by the PMD in the RX thread context. This thread will enqueue the mbuf in the rx_q FIFO. The KNI thread will poll all KNI active devices for the rx_q. If an mbuf is dequeued, it will be converted to a sk_buff and sent to the net stack via netif_rx(). The dequeued mbuf must be freed, so the same pointer is sent back in the free_q FIFO. The RX thread, in the same main loop, polls this FIFO and frees the mbuf after dequeuing it. For packet egress the DPDK application must first enqueue several mbufs to create an mbuf cache on the kernel side. The packet is received from the Linux net stack, by calling the kni_net_tx() callback. The mbuf is dequeued (without waiting due the cache) and filled with data from sk_buff. The sk_buff is then freed and the mbuf sent in the tx_q FIFO. The DPDK TX thread dequeues the mbuf and sends it to the PMD (via rte_eth_tx_burst()). It then puts the mbuf back in the cache. Ethtool is a Linux-specific tool with corresponding support in the kernel where each net device must register its own callbacks for the supported operations. The current implementation uses the igb/ixgbe modified Linux drivers for ethtool support. Ethtool is not supported in i40e and VMs (VF or EM devices). Link state and MTU change are network interface specific operations usually done via ifconfig. The request is initiated from the kernel side (in the context of the ifconfig process) and handled by the user space DPDK application. The application polls the request, calls the application handler and returns the response back into the kernel space. The application handlers can be registered upon interface creation or explicitly registered/unregistered in runtime. This provides flexibility in multiprocess scenarios (where the KNI is created in the primary process but the callbacks are handled in the secondary one). The constraint is that a single process can register and handle the requests.